Well I had my first physical therapy evaluation today. Things are looking good for the left knee! I discussed my right knee and hip problem with my new PT guy, Scott, and he believes that given what I've told him that I did indeed tear my hamstring at the ischial tuberosity... no surprise. I had difficulty working my right hamstring and Scott could actually feel the scar tissue in there. My right hamstring is considerably weaker than my left. I need to start working on that again. 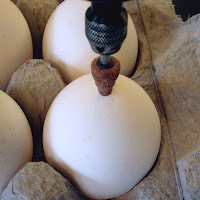 Next I carefully dremmeled a larger hole into the bottom of the egg. 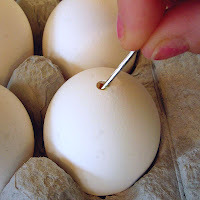 Here I'm using my tapestry needle to puncture the egg yolk and stir it up. Shaking works well to stir it up too, but you still have to pierce it. Don't forget to wipe off the small end where the smaller hole is before putting your mouth on it. 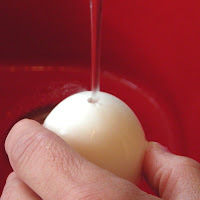 Rinse out the egg by running water into the larger hole. 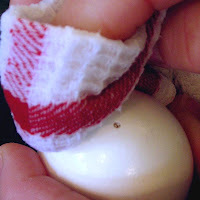 Cover both ends with your fingertips and shake it. Again blow out the contents. Do this like three times. After the egg has dried it's ready to be dyed. 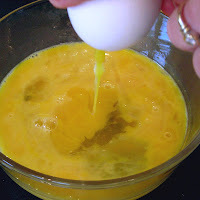 A hint: plug up the holes though with either beeswax or hot glue so your dye doesn't get inside the egg; if it does you can blow it back into the dye cup of course. Also you'll need to weigh down the egg since it now floats.